Today’s roundup is focused exclusively on individual Bluetooth keyboards (as opposed to combination keyboard-case models). Why? Keyboard cases are great, don’t get us wrong, but separate keyboards are really useful if you want to use one across multiple devices or position your keyboard comfortably away from the iPad—you can’t put the keyboard on your lap and the iPad propped up at eye level on a stack of books, for example, if the keyboard and the case are mated together. You’ll never have to worry about upgrading to a different size of iPad either as, regardless of which iPad you’re using, the keyboard will work just fine all the same. Here our are top picks for every budget and requirement. 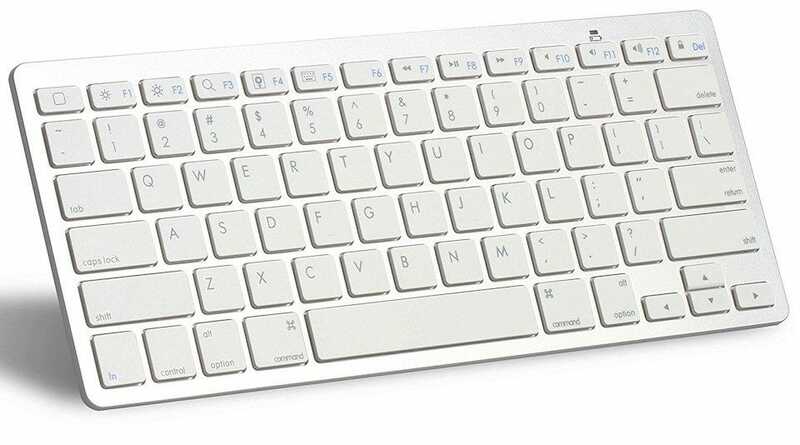 The Apple Magic Keyboard wasn’t designed specifically to be a portable iPad keyboard. 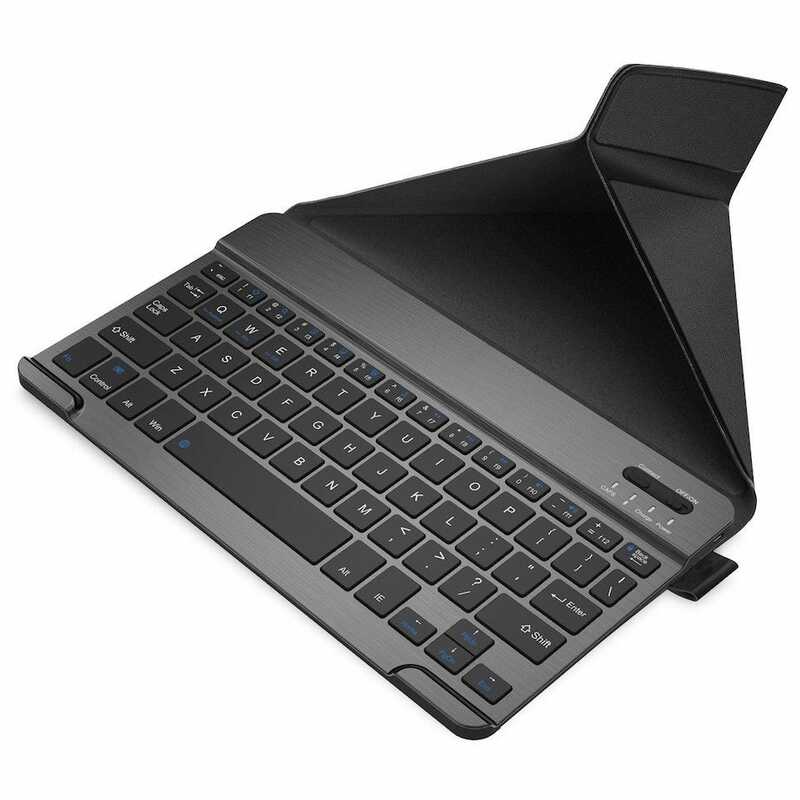 It’s actually a designed as a Bluetooth keyboard for everything with a Bluetooth connection from your desktop PC to your Apple TV to, yes, your iPad. That means it’s not quite as portable as some other Bluetooth keyboards here, but it still has a great built-in rechargeable battery that promises about a month between charges. 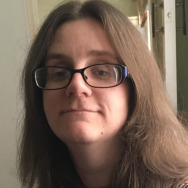 The Magic Keyboard is, at heart, a well designed Apple keyboard and sports just the right level of spring in the keys and comfort people have come to expect from Apple keyboards. A stable scissor mechanism underneath each key contributes to that familiar spring and the low profile of the keyboard is easy on your wrists. The joy here is that you can easily hook it up to any of your other devices, before immediately returning to your beloved iPad. On top of all that, this keyboard isn’t much smaller than a regular keyboard so you’ll be able to adapt quickly. If you thought a month’s battery life was impressive, the JETech Universal Bluetooth Wireless Keyboard will truly wow you with its promise of three months under normal usage. You can thank its aggressive power-saving mode that ensures it barely sips at the AAA batteries that power it. The keyboard is smaller than a regular keyboard but its low profile and generously spaced keys mean you won’t suffer too badly for it. It’s quiet to tap on too, so you won’t sound like you’re banging away on an old typwriter when you’re working at the coffee shop. Although we’re recommending it for your iPad, the keyboard was designed to easily switch between operating systems and with a simple tap of the function keys you can switch the keyboard shortcuts between iOS, Android, macOS, and Windows. Not only is it a good value for the iPad but it’s so flexible you can easily pair it with your other devices. It’s small and light enough to fit into your bag too. If you’ve never used a backlit keyboard, it’s easy to think it’s not that important a feature. Start using one, however, and you’ll never want to go back to darkness again. If you’re looking for the glow of the keys to guide your fingers, definitely snap up the Arteck Universal Slim Portable Wireless Bluetooth Keyboard for your iPad. 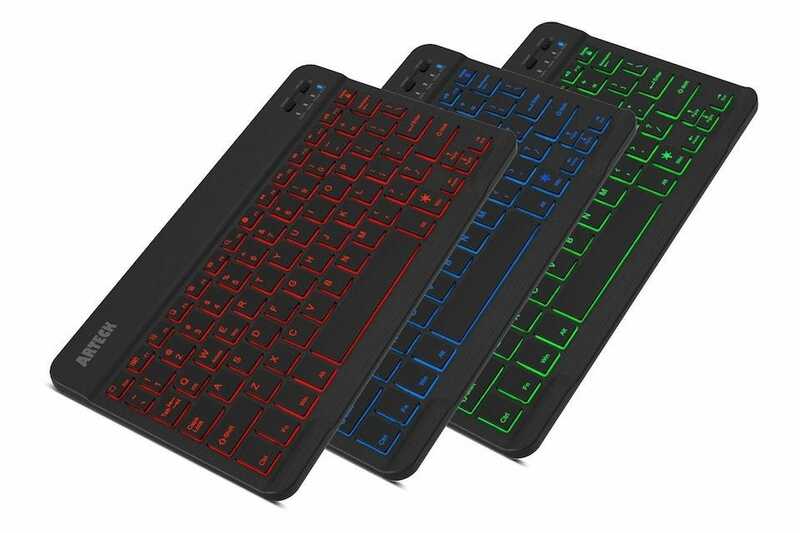 The keyboard offers 7 unique backlight colors with a choice of 2 brightness levels, and an auto sleep feature to save on battery power. Not that power conservation is a big concern for this particular keyboard—its rechargeable lithium battery should last up to 6 months between recharging. Whatever your choice when it comes to backlighting, the keyboard itself is suitably quiet yet responsive with system specific function keys available. It’s small and light enough that you can chuck it in your bag alongside your iPad for those out and about writing sessions. 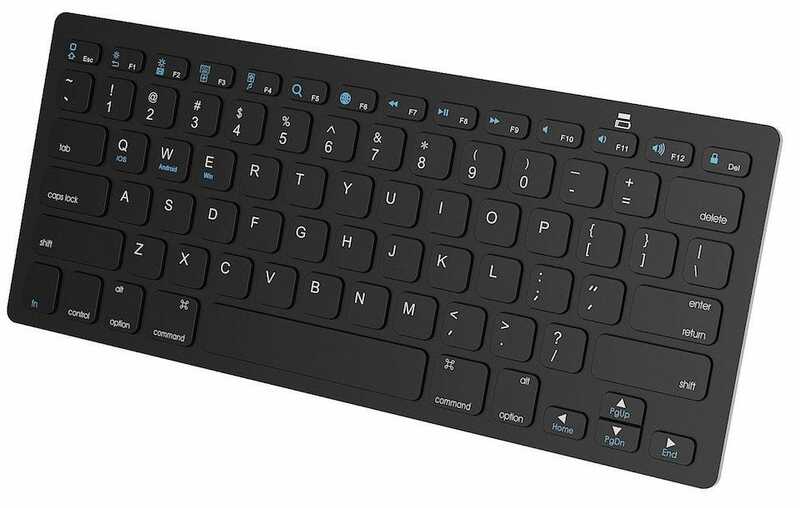 Sleek and lightweight, the Logitech Keys-to-Go Ultra Slim Keyboard is pretty stylish and certainly practical. It has a durable FabricSkin that withstands spills, drops, and crumbs, while remaining comfortable to the touch. Designed with the iPad in mind, it offers iOS shortcuts for fast and familiar typing, and it’s small enough to fit into a coat pocket. It comes with an iPhone stand so you can easily slot your device on top of it for extra convenience, plus its rechargeable battery lets you type for up to three months between charge. 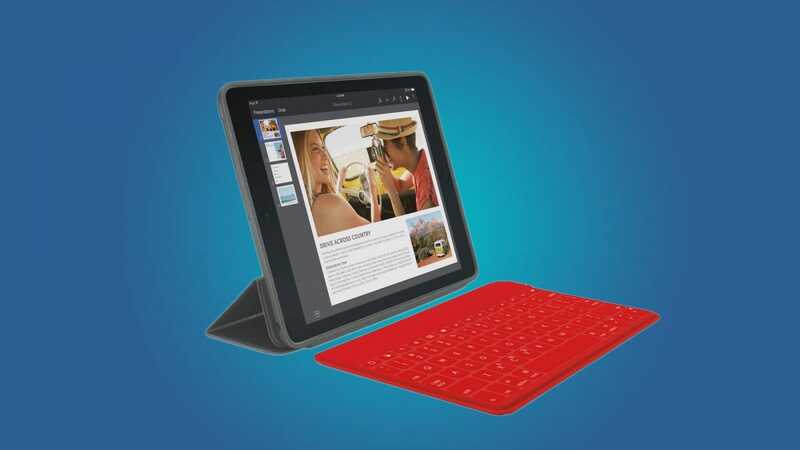 If it was only backlit, it’d probably be the perfect keyboard for your iPad. The Nulaxy Bluetooth Keyboard touts itself as great for business users—and while it doesn’t have any secret features other keyboards lack, it does sport a very sensible styling and polished look. It’s ultra slim and portable so it’s easy to toss into your backpack or briefcase, while still looking the part if you need to pull it out during a meeting. Its keys are suitably comfortable and quiet, with an energy saving mode meaning it goes to sleep after 15 minutes of inactivity. Based on two hours per day, its charge should last around two months. As a small bonus, there’s a leather cover bundled in which also doubles as a smart stand for your iPad, ensuring it’s great value for money. Fitting into the Apple aesthetic, the OMOTON Ultra-Slim Bluetooth Keyboard looks the part and acts the part too. While it might look right at home with the Apple color scheme, however, don’t expect the precision key construction and quality you’d get from the official Apple keyboard we highlighted above. None the less, it’s a sharp looking little bargain of a keyboard. There’s a long battery life (about 30 days of continuous use), and an automatic sleep mode that helps it last up to 6 months between battery changes. You won’t find a fancy lithium-ion battery in it at this price point, but it’s easy enough to swap out the 2 AAA batteries when they finally run down. It’s small and lightweight, proving to be just big enough to work for your fingers without being clunky to carry around. 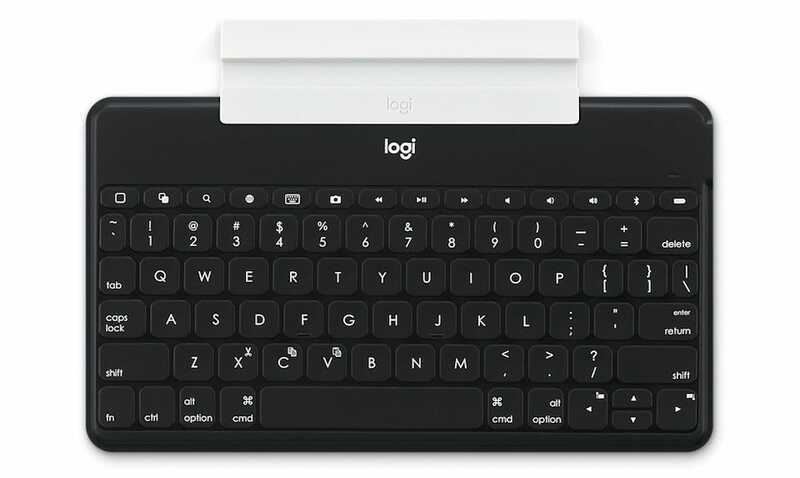 If all you want is a basic Bluetooth keyboard that looks at home with your Apple product, this is it.